This should be a very busy and full council meeting with lots of 'meat' on the agenda. 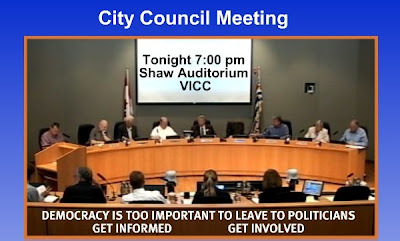 The LED sign guidelines are on the agenda as well as several delegations from the public, one regarding dog parks, one regarding the proposed cell tower and the return of the "Operation Nanaimo-Gram" flag to the Vancouver Island Military Museum. To view the agenda for this council meeting use this Nanaimo Info LINK. Turn up & listen, Watch TV but take the newspapers comments with a pinch of salt. The local newspapers are often filled with falsehoods & lies.